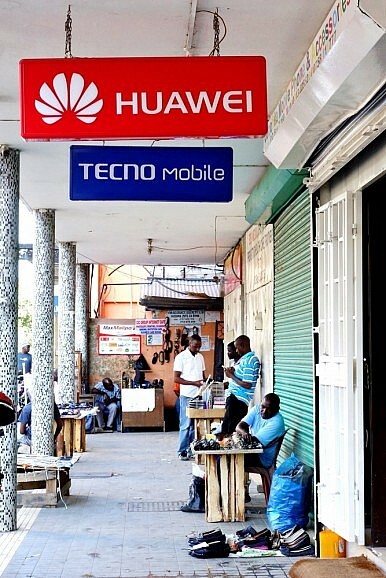 A sign for Chinese telecom company Huawei in Dar es Salaam, Tanzania. Untangling the diverse threads that make up the “China in Africa” narrative is a herculean task. The ugliest problem with regard to China’s role in Africa isn’t reconciling the good with the bad but reconciling perspectives on what’s considered good or bad. China colonizes Africa, rapes it of resources, empowers dictators—or it invests in Africa, builds infrastructure, pursues diplomatic engagement. Splitting the difference between these views is a big ask, even for seasoned insiders, and the media rarely helps. One reason the media gives China’s efforts short shrift is that we recall Beijing’s aggression toward Taiwan and Hong Kong’s bids for freedom, its brutality at Tiananmen and in Tibet and Xinjiang, as well as its abuse of Falun Gong practitioners, Christians, reporters, activists, artists, and lawyers. And we’re reminded, as recently as this month, that Beijing is arrogantly unrepentant about its human rights record. Start the story of foreigners in Africa with the independence of African nations, and not with the colonial tyranny preluding it, and the West looks gallant while China comes off like an opportunist. It all comes down to how you frame the narrative. We’ve all heard about people like Yang Fengqian, the “Ivory Queen,” thanks to whom African elephants will soon be extinct, but how many of us are familiar with the Chinese conservation heroes in Africa? These redacted narratives are often not even clipped in a consistent way. When Mexican gangs terrorize Los Angeles we almost never look to Mexico City, and when Syrian refugees flood Europe, we direct our anger at the refugees as much as at the emirate in Raqqa, yet when we hear about Chinese managers abusing workers in Zimbabwe, we fold this into whatever colonial designs we imagine Beijing has on Africa. But not all Chinese in Africa represent Beijing. As Howard French notes, many Chinese go to Africa for the same reason Mexicans go to the United States—opportunity. And yet much of the ill will for China’s presence in Africa stems from the idea that Beijing doesn’t meddle. It feels no counterpart to white man’s burden. Like the many Chinese who move there, Beijing wants to fish in troubled waters. Critics say it ought to do more, but foreign aid doesn’t really help and foreign meddling in Africa already has a nasty past. Besides, as we’ve seen, Beijing does meddle. In fact, a better criticism is that Beijing is dishonest because it tries to sell itself as a non-interventionist even though it has impacted a number of independence struggles, including South Sudan’s, which wasn’t in opposition to a European colonial power. Despite the atrocities caused by the new South Sudanese government, and despite promises to the contrary, China’s largest weapons manufacturer, which is state-owned, has been repeatedly caught arming this regime. China’s military support of brutal governments, especially if motivated by a desire to secure resources within the region, warrants censure. So too does its ruthless harvest of natural resources, such as its destruction of forests worldwide, particularly when these activities are illegal, as in the Democratic Republic of Congo, a situation made worse by Beijing’s refusal to regulate these crimes. But what’s easily lost is the nuance of each case, which blurs the distinction between Beijing supporting an oppressive regime, illegally extracting resources, or making win-win economic investments, not to mention the dirty dealings of private Chinese companies like the Queensway Group or individual Chinese managers abusing their workers. All these get swept under the clumsy umbrella theme of “China in Africa,” and so to the extent that we do resign ourselves to that term, we can never arrive at a one- or two-word verdict on the matter. Regardless of any external factors, but especially given the West’s own history of enslavement and colonialism there, we need to acknowledge Africa’s right to chart its own path, which isn’t to justify any harm wrought by Chinese businesses or state enterprises. Maybe so, but all they need to do is look east, to China, and they’ll see what happens when other leaders suppress freedom while the young population, also huge, well-educated and connected, seems less likely, eventually, to rebel because they’ve settled for economic rather than democratic gains. And whether Chinese ever change their minds, or Africans make the same choice, is theirs to decide. How a Pay TV Company Is Serving up a Soft Power Win for China in AfricaIs China Undermining Its Own Success in Africa?Zambia Debates Chinese ‘Economic Slavery’Mines, Money, Mandarin: China in ZambiaAre Chinese Loans To Africa Good or Bad? That’s The Wrong Question.